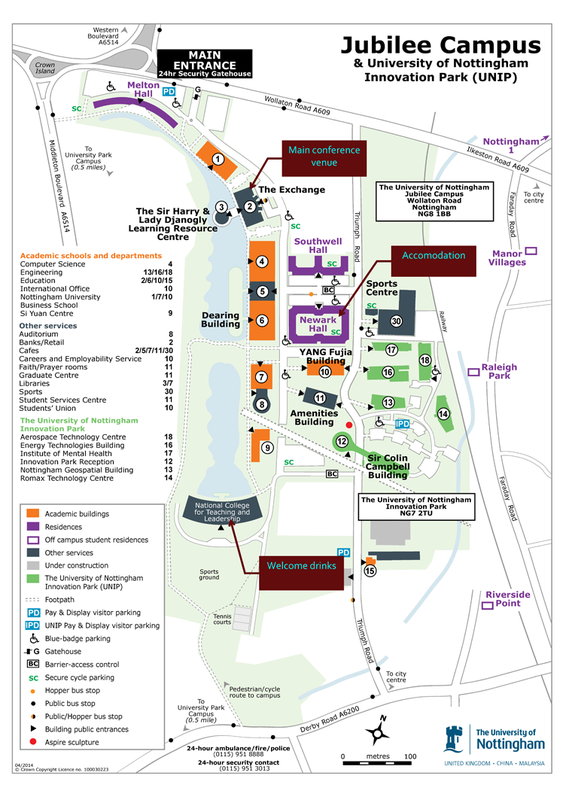 Details of how to travel to Jubilee campus by car, air and from Nottingham can be found here. Jubilee Campus is about a 40 min drive from East Midlands Airport, and about a 10-15 min taxi drive from Nottingham itself. A London St. Pancras to Nottingham train journey usually takes just under 2 hours. Parking at Jubilee Campus is available for registered attendees. If you are arriving by car, please explain on the campus gate that you are here for BMVC 2014. Once you are on campus, please collect a parking permit from reception at Newark Hall and display it clearly in your windscreen. Cars without a permit are liable to receive a fine (and this is enforced). As a BMVC delegate, you can park on campus free of charge for the duration of the conference (whether or not you are staying in Halls accommodation) if you display a permit.